Effortless natural-looking hold even when humid. 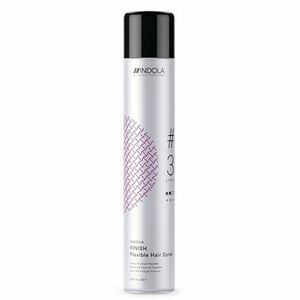 Indola Innova Finish Flexible Hairspray represents step #3 in the Indola Innova Finish hair care programme. It is designed to have staying power, effortlessly delivering natural-looking hold. It combines a UV-filter with Indola's pixel technology to bring hair back to a virgin-like quality with glorious colour shine. The new Indola Innova Finish Flexible Hairspry is not only an update to the old Innova Finish product, it also replaces Clynol Finish Freeflow Flexible Spray which has been discontinued. Available in a 500-ml can. £6.66 (inc. VAT) Why no VAT? We're a trade wholesaler and quote our prices without VAT to help our VAT-registered customers understand the true cost of a purchase. Fabulous conditioner that locks colour into hair for up to 90% colour retention even after 30 washes. Available in 300 ml or 1500 ml. Caring leave-in treatment cream mask that locks colour into hair for up to 90% colour retention even after 30 washes. Comes in 3 sizes: 30 ml, 200 ml or 1500 ml. Reusable PVC cape that's waterproof and provides excellent protection for your clients' clothes at the backwash. Velcro fastening. Comes in 2 colours: Black or Grey.